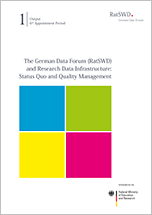 RatSWD [German Data Forum] (2018): The German Data Forum (RatSWD) and Research Data Infrastructure: Status Quo and Quality Management. RatSWD Output 1 (6). Berlin, German Data Forum (RatSWD). https://doi.org/10.17620/02671.30 [dd.mm.yyyy].